Australian All Star Cheerleading Federation (AASCF) , is an organisation for All Star cheerleading coaches & athletes around the country dedicated to the promotion and advancement of All Star Cheer & Dance as a respected athletic discipline and sport. AASCF provides coach education & accreditation, conferences, camps/clinics, judges training and Australia’s largest National competition series. AASCF is Australia’s most prestigious event producer offering championships all across Australia from June to November with the sports crowning glory being AASCF Nationals where where over 1000 teams from across the country compete for the coveted title of National Champion. 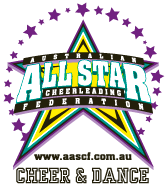 AASCF has been the driving force in the development and expansion of the Australian all star cheer & dance community since it was established in April 2005. At AASCF, we believe that cheer and dance is much more than competition, trophies, and applause! All Star Cheer & Dance is more than just a sport - it is a great way to learn life skills that will serve athletes well for years to come - teamwork, dedication, loyalty, commitment, compromise, hard work=results. Not only do AASCF provide the ultimate competition experiences, we also provide expert education opportunities for athletes and coaches alike - continuing our commitment to safely progressing Cheer & Dance for the benefit of the whole community. AASCF founders have been involved in cheerleading & dance for more than three decades and could see the necessity to bring All Star Cheer & Dance in Australia to a new safe and professional level. Realising that by teaching a proper balance of skills, technique and safety, All Star Cheer & Dance could be more than just fun thus AASCF started its highly acclaimed educational program for both coaches and athletes. From the outset we realised the positive impact cheerleading and dance can have on all those who take part, teaching each athlete discipline, keeping fit, the importance of being a individual but also the reliance of others when being part of a team. From the beginning AASCF invested in the sport and fast became the bench mark in Australia who others now aspire to. AASCF was one of the very first organisations outside of the United States to join and be accepted by the USASF / IASF Governing Body. Investing heavily in the USASF / IASF rules AASCF brought them to Australia in 2006 to allow uniformity across organisations and countries. We were one of the first International companies to offer teams the opportunity and funding to take part at Cheerleading Worlds held each year in Orlando, Florida. USA. AASCF is cheerleading in Australia today, with its education, competitions, camps, and apparel! What is All Star Cheer?? Do we have All Star Cheer in Australia? How often do we who are involved in the sport hear this? Hope you enjoy it and please share and distribute to as many as you can to promote our sport to the wider community..
WOW what an incredible Nationals event you and your team produced this year! Our families loved every minute from the huge Pinnacle Banners welcoming all the athletes out front to the uber friendly onsite staff and the incredible rock star atmosphere you created in the Performance halls. You guys thought of it all from the signage, pole wraps, stair features, athlete gift bags, tumble track and the list goes on and on and really made for such a unique Nationals experience. As a gym owner I can see how much love and passion you put into the event and know countless hours would have gone into creating the magic we all experienced at Nationals. We truly appreciate everything you did. I cannot wait to see what amazing things you come up with next year! In the meantime, I hope you take a moment to sit back and reflect on the incredible achievements you have accomplished this year! Stephen James and Rosemary Sims-James have done so much for the sport of Cheerleading. AASCF is by far the best cheer organisation in Australia. I was at a Winterfest competition when my daughter first started cheer and an USA judge spoke and said AASCF had achieved in 5 years what it took the US 15 years to achieve. Look where we are now? Just wanted to pop you through a quick email as I'm sure your inbox is still FULL & you have lots to get through, but anyways on behalf of myself & my club (parents, athletes) we just wanted to thank you for again such an awesome event. We appreciate that you have split things into Extra Small, Small & Large gym as it made nationals feel like we had a chance to do well & not just there to make up the numbers. We especially loved that ALL halls had awesome lighting effects & this made all our athletes feel special, not just the higher level teams in Hall A so thank-you for that. All your staff as always were great but a special shoutout to the 2 lovely people you had on the warm up door, I didn't catch their names but they were so helpful & patient all weekend so if you could please pass along our thanks & well done to them. We look forward to bringing teams to your events again in 2017. We are so excited for our friends Rosemary Sims-James & Stephen James who are hosting one of THE LARGEST competitions in the world this weekend. With 1400 teams/ 10,300 competitors / 15,000 spectators it is simply massive. Steve & Rosie have given so much to the Australian Cheerleading. Their service expands far beyond the direction of their company. They have stepped up to lead this country and its participants without any mandate, they provide educational & training opportunities to coaches and athletes, they are innovators, pioneers & trailblazers in terms of products and services, have counseled TONS of young leaders and business start ups to success and are simply the best people to have in your corner as friends. Australia... you are SO LUCKY to have these two fighting for & believing in you! Have the best weekend... take a moment to sit back and take in all you have accomplished and built! We love you both! Can I just say WOW!!!!!!!!! SUNDAY WAS INCREDIBLE!!!!!!!! All our students are motivated to compete next year! It was very well organised and I’m sure it will grow again next year... you will probably need to run it over 2 days soon! CONGRATULATIONS to you and Rosemary on a fantastic job! Anyway, on behalf of my team I just wanted to write and say thank you and congratulations. I for one am very grateful for the support AASCF give us and I look forward to growing as a coach with the girls. I just needed to write to say thank you for such a well organised event yesterday. It was such an amazing feat in organisation and coordination and I marveled at just how smoothly everything seemed to run. We were extremely overwhelmed when we arrived and had no idea what we were to do, but the AASCF team were all extremely helpful and polite, and really went out of their way to make us feel welcome and at home. I'm a parent with Dez & Kass at ECA in Newcastle and wanted to let you know what an awesome time we had at State. I have been involved both State & Nationally as a judge & coach with gymnastics, and have never enjoyed watching a sports event as much as I did at Penrith. I had so much fun, and loved the whole atmosphere and team spirit shown by all clubs. I just wanted to pass on our congratulations on such a wonderful event on Sunday. All the girls were so excited the whole day, the parents loved watching all the action and I know we all learnt a lot and are in awe of what the other teams are doing! It was a fantastic event and you and your staff are to be congratulated for the effort you put into ensuring the whole event was such a great experience for all the students. First up, thanks so much for the amazing event that was Nationals - my whole squad just raved about how well organised and fun and professional it was (and I loved it too). Congratulations on a fantastic comp AGAIN!. A wonderful event for all , the best our team truly LOVE !. Thanks for the great day on Sunday! It was my first cheer competition and thought it was awesome, fantastic atmosphere!!!! Congrats on how well it ran! Just wanted to say a huge thanks to all you guys for putting on such fabulous comps this year! Nationals were awesome on the weekend, and all the kids and parents were so happy with how it went! So thank you again for providing such a great experience for the cheerleaders and dancers! We just wanted to write to say thank you for running such a professional, well-organised, and exciting NSW cheer comp! We couldn't have had a better, more positive experience for our first comp, and thank you again for all your helpful advice in the lead up to the comp. Congratulations on the competition though. It was great and ran really smoothly. You're so lucky to have so many wonderful people working for you. All your staff are always so nice and friendly and just can't do enough to help everyone out with whatever they need. I hope, as I expand my club, that I'll be able to find people with such great attitudes too. I just wanted to congratulate you on the amazing competition you held over the weekend and say thanks for all the hard work you put in to make the day such a success, it was really well run and everything flowed smoothly. I know I had a great time and the rest of the gang feel the same. Brilliant job guys, I can't wait to see what next year will bring! The sport has come along way and a lot of credit can go to you and your wonderful competitions. All of my kids loved your competition. It was fun, relaxed, friendly and informative. Your clinic at the end was great, thanks for such individual and helpful info. We learnt more from that 1 hour than we did at a 2 day course we did last year because you could teach us what we needed for our level. Just a quick note to say nationals was great and I had a wonderful time. Watching your teams and other higher level squads was so inspiring and entertaining. Thanks so much for putting this all together - we definitely appreciate it! Just wanted to congratulate you both on a job well done in Sydney with the biggest cheer event in Australia to date. The atmosphere was great and everyone obviously had a great time!! "Hey! Thanks for another great competition on the weekend! It's so exciting how big the comps are getting - and it’s great that they still have that small-comp feel (everyone is so nice). Looking forward to the next one!" I just wanted to drop you a note to let you know that I thought Saturday's comp was one of the best I have been to in the six years that Tess has been associated with cheerleading. The day flowed well, the sound system was great, and the staff were all fantastic. Even towards the end of the long day, you all managed to have people on their feet jumping up and down, excited about the possibility of receiving a free T-Shirt. Kara was gorgeous and how refreshing to see a judge who actually looks interested and keen to choose the deserving winner. Far better idea to have your own staff than ask for untrained volunteers from the Squads - this has caused many a disaster in the past with other organisations. You, Rosemary and the rest of your team did a great job, the comp was professional, fun and had a very relaxed atmosphere, which is hard to find at a comp. I hope to be a part of the AASCF comps next year, I always have a lot of fun when I go. First of all, congratulations on the event on Saturday! It all seemed to go very smoothly and it was fantastic to see so many competitors on the stage doing their routines! Our kids had a fantastic time, and we won our section which was an extra thrill!